Luca Magni is on a mission. He's building an aircraft against the clock. Next to the spectators' stand at the FAI World Air Games Palm Dropzone, the Italian from Varese, has been turning the contents of three large packing crates into a fully functioning gyrocopter. He's been beavering away with a colleague for days now, and expects to be ready to fly it after four days' work. "The aim is to show people that they can build these kits. It does takes a certain level of expertise of course, but it's quite accessible," said Magni, who makes and sells kits like the one he's assembling. Next to him is a part-assembled Aiero 1 aeroplane, designed in the United Arab Emirates. It is also being constructed during the World Air Games by Thomas Hartzdorf and, although it's not a race, there is some gentlemanly rivalry between the two teams to see who will take off first. Hobbyists around the world are responsible for building and flying their own small aircraft with one to six seats. Some are designed for increased efficiency and speed. 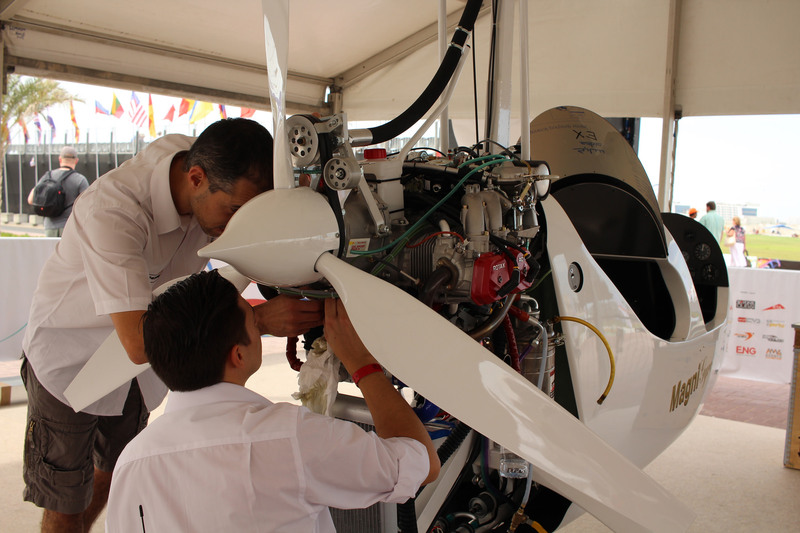 But even children are able to build their own aircraft here at the World Air Games in Dubai. Next to Hartzdorf and Magni, up to 50 children have been building and decorating polystyrene model planes before test flying them around the venue.